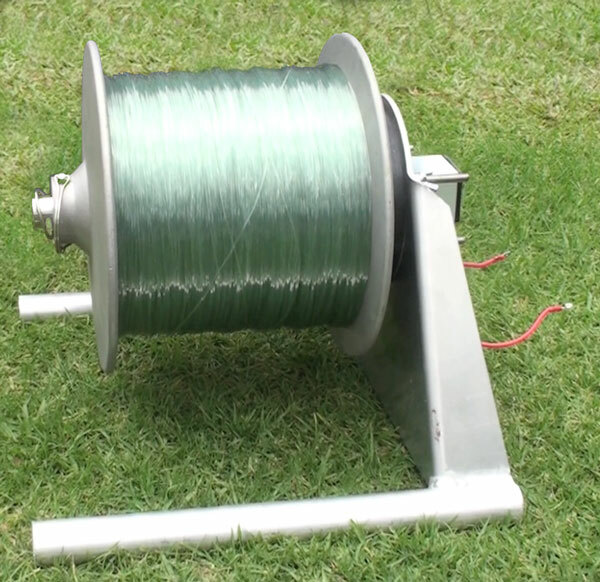 Powerful Fishing Winch - 230 Watt 12 Volt DC. The new fishing winch has real power and strength. 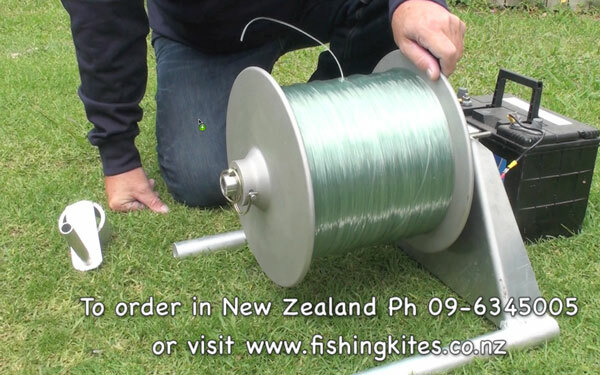 It really comes into a class of it's own when you are unlucky and catch drifting weed or or a school of sharks or big stingrays on your kontiki or kite fishing rig. Above: Video explaining all the parts and demo of the power. 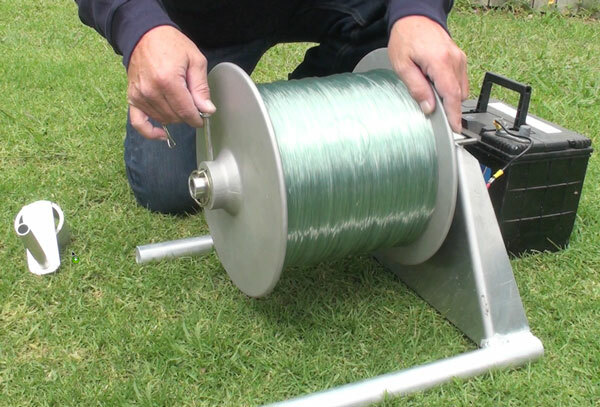 This fishing line hauler has exceptional pulling power, the big motor, robust frame and heavy duty spool make this winch ideal for hauling in the biggest kites and rigs, it will easily haul multi-kite rigs in, even when strong winds and bad weed conditions are too much for other winches. 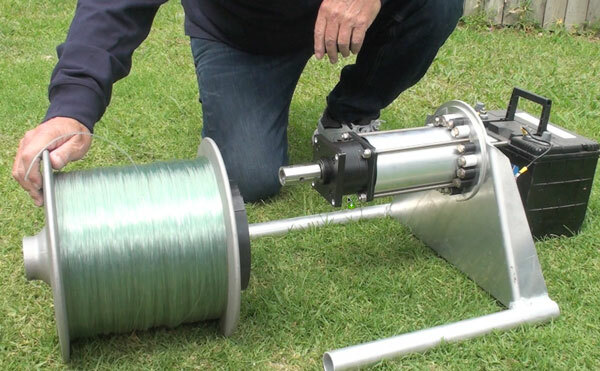 This Fishing Winch Has Many Advantages. This new winch has a heavy duty cast aluminium spool, 5mm aluminium plate frame and 50% more pulling power than other popular kontiki fishing winches. 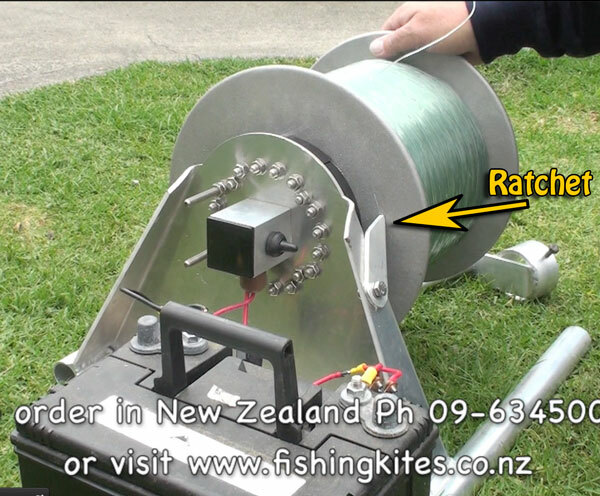 It is engineered electrically and mechanically to haul in anything a kite or kontiki fisher is likely to encounter. This is the winch you have always wished you had when hauling in the biggest multi-kite fishing rigs in gale force winds. It will handle big hauls of sharks and stingrays, weed, big fish catches, powerful rips and kite fishing in strong winds. This winch is built to handle it all. Below: The Powerful 230 Watt Planetary Gear-Motor is securely mounted inside the heavy duty winch drum. 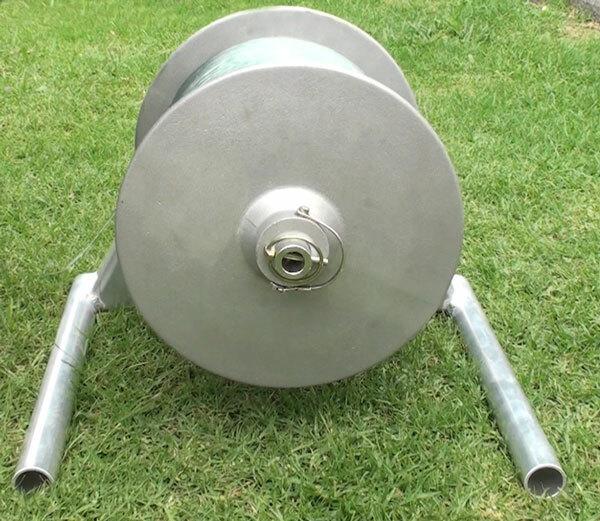 Below: The cast aluminium drum has a 15mm wall thickness, this heavy duty winch drum can handle even the biggest loads encountered by kite and kontiki fisherman. The large spool core diameter gives a consistent hauling speed from beginning to end. Below: All wiring connections to the switch are protected inside the extruded aluminium square. Spray proof caps and switch cover ensures rain or salt spray can't get into the wiring or switch. Below: A ratchet securely locks the spool against feeding any line out beyond the desired setting distance. 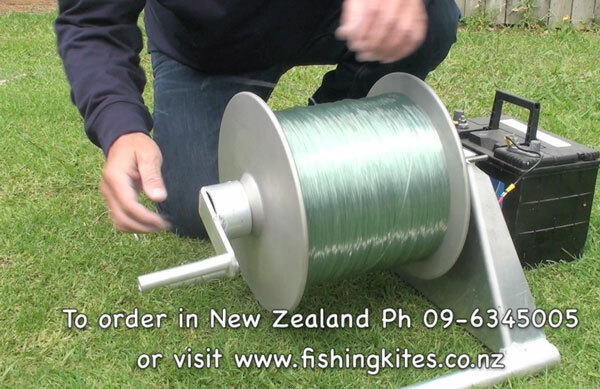 This is particularly important for all kite fishers and kontiki fishers fishing in strong rips. The ratchet automatically flips out of the way during gear recovery as soon as the fishing line winch is turned on. Below: The two tractor pins serve different purposes, the one nearest the end of the shaft prevents the winch spool coming off and is left in place unless you are removing the spool. The other tractor pin locks the spool to the drive shaft when in the hauling mode and is removed when setting so the spool can freewheel. Below: If your battery runs flat a handle allows for manual line recovery. To fit the handle simply remove the drive pin. Note: This unit is very efficient so it shouldn't run your battery flat unless you forget to charge the battery. Below: Put the handle on, lock it in place by rotating the bolt so it enters the hole the drive pin was in. 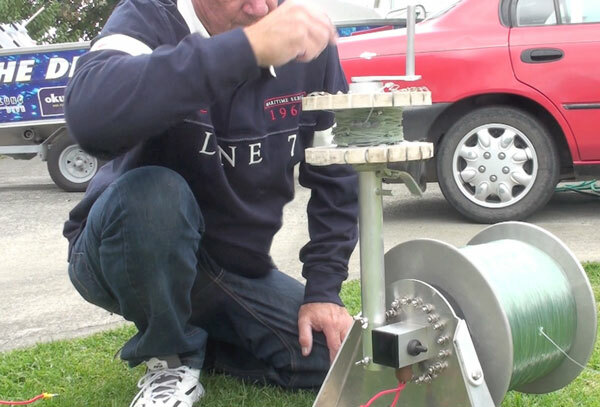 Below: A 30 amp fuse it fitted inside the black plastic housing on the battery lead. It's a good idea to have a spare on hand just in case. If you ever do blow a fuse it takes less than a minute to fit a new one. Below: The two long bolts at the back of the winch can be used to bolt any extras to. In this case they are used to attach a ShoreThing hook recovery post. 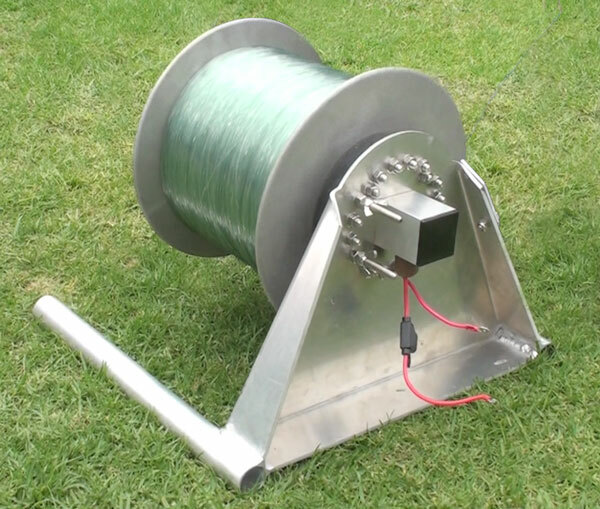 Below: The 230 watt 12 volt DC Planetary Gear Motor on this winch is very a electrically efficient, low friction configuration, especially under load. 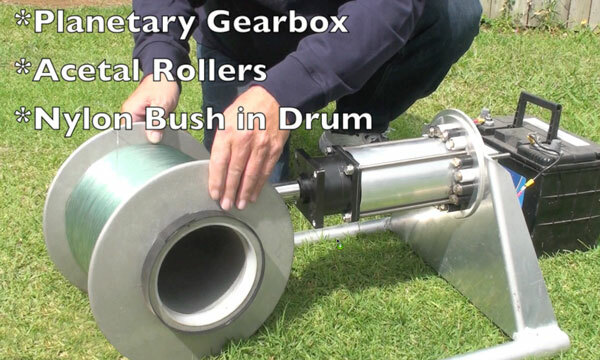 Acetal rollers attached to the winch frame and nylon bush in the winch drum form a roller bearing, this further increases the efficiency and reduces friction. All bolts and bushes are made from stainless steel. Below: The rubber seal on the outside of the winch drum fits snugly over the bearing flange on the reel frame. It keeps sand and spray out and provides an effective amount of drag to prevent winch over-runs when setting. 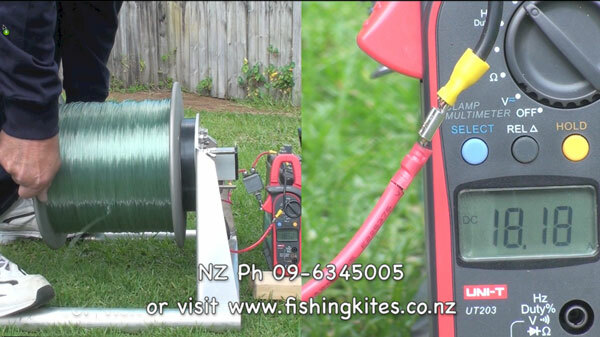 It only takes seconds to remove the spool, this is a real bonus for those who use two or more styles of fishing. 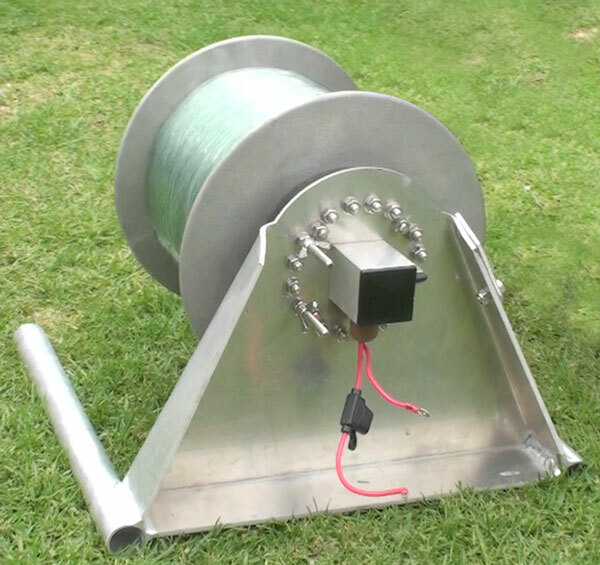 No need for two or more winches, a spare winch spool with the other system wound on it is all that is required.